Alexandria, Pineville and the surrounding Central Lousiana area have a variety of outdoor attractions and recreational areas. 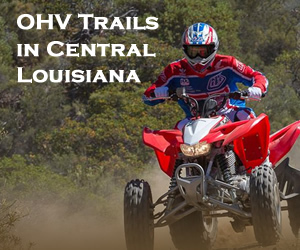 Included on this page is a list of popular OHV, ATV, motocross, biking and off-road trails and camps in the Alexandria area. Visitors can utilize many recreation areas, view endangered species or geologic sites, ride the trails, camp, and hike. 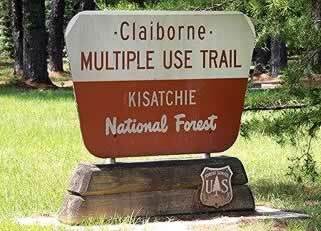 Popular Mutli-Use trails are available at the former Camp Livingston and Camp Claiborne sites and are administered by the U.S. Department of Agriculture, Forest Service, Kisatchie National Forest. 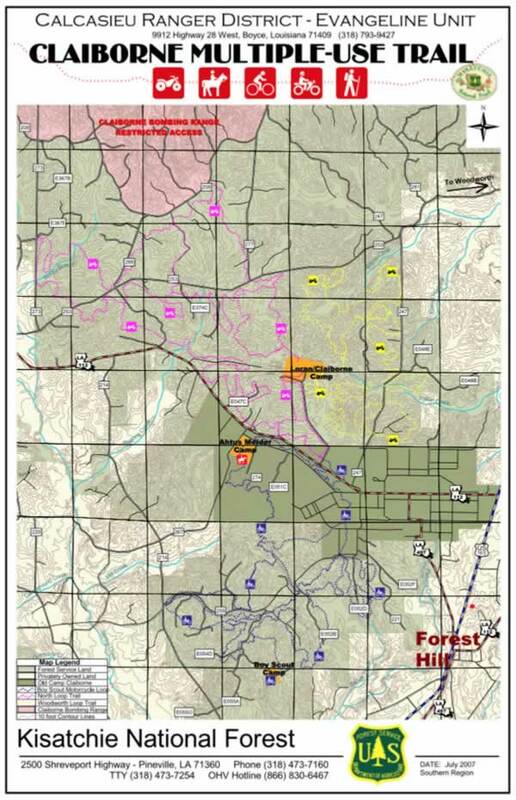 The national forest also includes Kincaid Recreation Area, Valentine Lake Recreation Area, and the Wild Azalea Trail. Admision fees may be charged. Hickman Trailhead (Trail) - Operated by USDA Forest Service. This is a moderately difficult trail that traverses through varying trail types but is predominately upland pine hills. Although the Hickman Trail is a loop trail, it can be used with the Little Creek Trail Loop to extend a visitor's experience. Little Creek Trailhead (Trail) - Operated by USDA Forest Service. The Little Creek Loop Trail is an easy-to-moderate OHV trail that traverses across a wide variety of terrain. 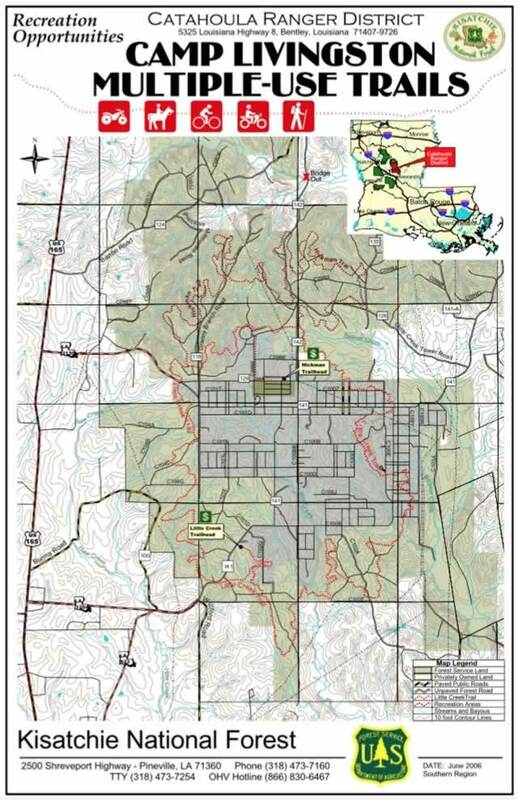 The Claiborne Multiple Use Trail includes a 70-mile system for hiking, walking, OHV riding and biking. Claiborne trails are available for ATV, motorcycle, and horse use. Hiking and biking are also allowed on Claiborne and Enduro Trails; however, they are primarily used for motorized and equestrian riders. Enduro Trail - Operated by USDA Forest Service. From Cravens intersection of Hwy 10 and Hwy 399 N, take 399 north 1.9 miles and turn left on Road #440. Proceed 1.2 miles and turn left on road #442 into the Enduro Camp & Trailhead. Evangeline Camp - Operated by USDA Forest Service. 4 miles south of Louisiana Highway 28 on Forest Road 273 (Messina Road). Boy Scout Camp - Operated by USDA Forest Service. Designated for use by motorcycle campers. Neat Forest Hill, Louisiana. Loran/Claiborne Trailhead Camp - Operated by USDA Forest Service. These trails are available for ATV, motorcycle, and horse use. Hiking and biking are also allowed on the trail; however, they are primarily used for motorized and equestrian rider. The Ahtus Melder Camp is used by equestrian riders utilizing the Claiborne Trails. Corral Camp - Operated by USDA Forest Service. Primitive camp inside the National Red Dirt Wildlife Management Preserve. This camp is available for OHV and general camping. Lotus Camp - Operated by USDA Forest Service. Visitors to the Kisatchie Ranger District for the purpose of OHV riding can utilize the Lotus Camp for day-use and camping. Sandstone Multi-Use Trail - Operated by USDA Forest Service. 36 miles in length. This trail offers a wide range of scenic views and riding experiences. The trail is designated for OHVs, motorcycles, horseback riding, mountain biking, and hiking. Hidden Treasure RV Park - 16 miles outside of Alexandria, LA via I-49 or LA Highway 28.